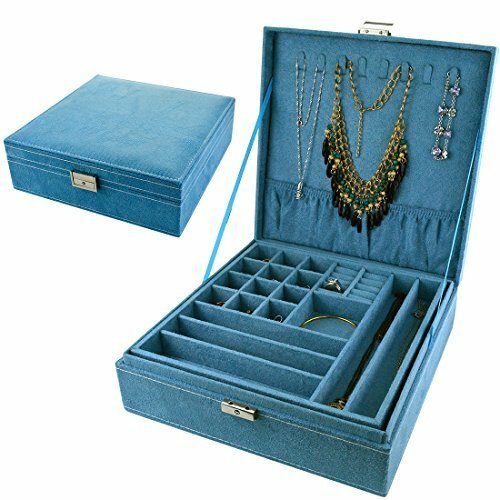 Bantoye Double-Layer Jewelry Box Suede Lint Square Display Storage Case with Lock Blue 10.4"x10.4"x3.4"
Our jewelry case has two layers that the first layer has 12 small square grids for earrings, 5 rectangle grids for necklaces & bracelet, and 2 rectangle grids for rings. The second layer is designed for bracelet. What the surprise is there are still space for necklace on the box's back. It's a jewelry chaos killer for women. Why are you still hesitating? Our box has the most charming color that is the ocean color. You will not be bored to see it everyday. Do anybody get sick of the sea? The answer is NO. The blue color is one of healthy color which can adjust vision. There is a saying goes that much warm color to see, happier you will be. If you are still annoyed with your mass of jewelries, our jewelry organizer can help you. It has more divided space for you to sort out the exact place of your jewelries. If you have any questions before or after buying, please don't hesitate to contact us. We will be delighted to solve your problems. If you are unsatisfied with the broken mistake which is due to the package and logistics, please feel free to contact us. We will try our best to give you a satisfied solution. If you are interested in our product, why do you still hesitate? Press the " Add to Cart " button right now. Don't letslip an opportunity as it may never come again. SIZE AND COLOR: The dimension of the box is 10.4 x 10.4 x 3.4 inches. Blue. Multi-layers double lattice design with double storage space and it is suitable for a variety of jewelry storage. The color of picture might be a little chromatic aberration due to the shooting light. MATERIAL COMPOSITION: Advanced Suede material, wooden lining and metal accessories. The body is made of environmental friendly velvet, which is touched softly and looked beautiful. The inside and outside box are made of good suede material which is anti-abrasive, non-deforming and colorfast. PRODUCT HIGHLIGHT: The lock with silver plated is fine and solid. The lock is made of high quality material, which is not only exquisite and durable, but also environmental friendly. What's more, it is not easy to get rusty. The high-quality lock still be smoothly in unlocking even though it through tens of thousands of usage. SPECIAL DESIGN: The first layer is designed in square pattern , you can store more jewelry in it. The box top cover has eight hooks, which is convenient for you to show the necklace effect. The second layer of the storage box is equipped with 9 large grid, which is convenient to store necklace, bracelet and other large jewelry placed. SHAPE AND APPLICATION: It is very practical and having beautiful retro style. It is suitable for you to store jewelry, watches and accessories. What's more, it is a perfect gift for you to send other people as a gift for their birthdays, weddings and other festivals. If you have any questions about this product by Bantoye, contact us by completing and submitting the form below. If you are looking for a specif part number, please include it with your message.